One adjustment I made my second year of teaching that I NEVER regretted was creating an "Estación Estudiantil." From the poor picture quality it is hard to tell, but this small table was located directly next to the door to my classroom and also next to the turn in tray that my students used when it was time to submit their assignments. My goal was to keep students away from my desk and to avoid constantly getting office supplies from my desk for them. This way, students could find what they needed, when the needed it and leave me out of the picture! Then, I labeled them all in the target language. I lined them up on the table so the students could see everything and so that multiple students could use the table at once. The pencils went in a pencil jar. The scissors went in a jar as well. If I found random rubberbands, paperclips or other supplies on the floor throughout the year, I threw them in the jar. I printed out a label for my table as well by finding a font I liked, cutting and pasting it on bright construction paper and then laminating the whole thing and hanging it up with magnets. Underneath the table, I had a crate labeled "pizarritas" for white boards. I normally had another crate (not pictured here) labeled "premios" full of random prizes for class competitions. My policy was that students could use anything on the table at any time without asking me. By the end of class, everything had to be returned to the table. If something went missing, I never replaced it. Of course, we mysteriously lost all our pencils by the end of the year, but that just meant the students didn't have any "grace" pencils and they had to remember their own! I would encourage ANYONE to do something similar, even if it is not in Spanish. 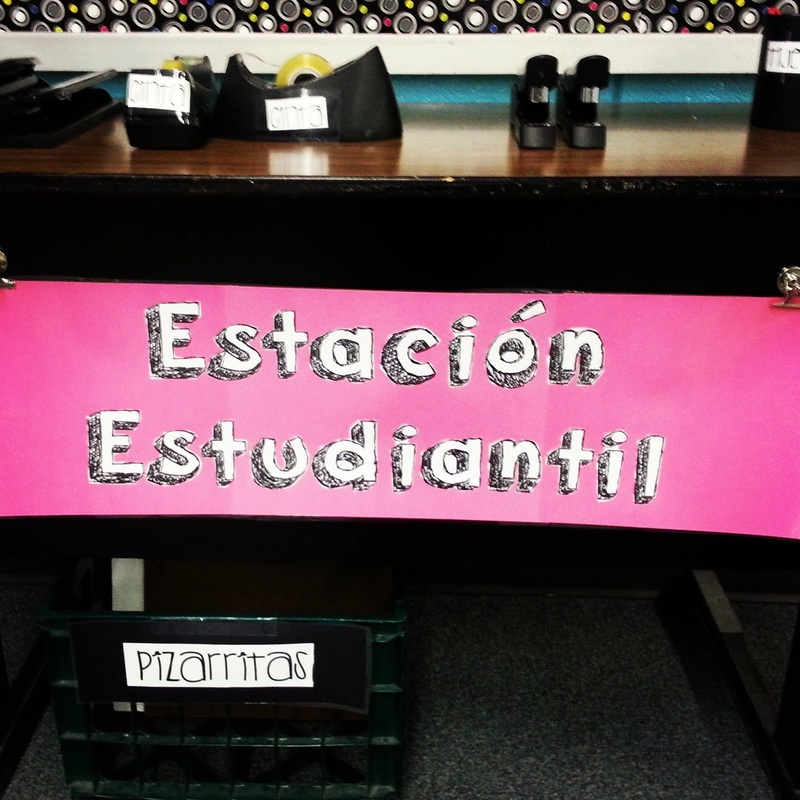 You could customize this station with whatever students need in your class most commonly. It never became a distraction or a problem in my room; the students who needed to use these items frequently came in a minute earlier to get them done before turning in their assignments. All in all, it was a way for me to streamline the process of getting assignments organized and completed without ME having to do anything during class time.